It's more of a shade tunnel, running roughly east-west and very roughly on contour. Made with steel pipe, heavy duty electrical conduit, and the help of a few of our friends. 6m in length, with 6 hoops about 1.2m apart on each side. It's about 3.5m wide. 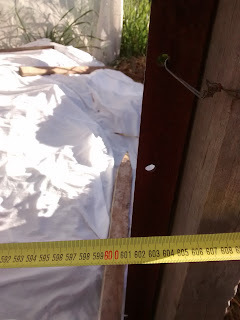 A star picket and a length of old wood hold up the middle of the arches on each end. A hole is drilled into the wood for the 4 way connector to "plug" into. It's also expertly wired together (Thanks Alan!). The blue glue holds the hd conduit into the connector. 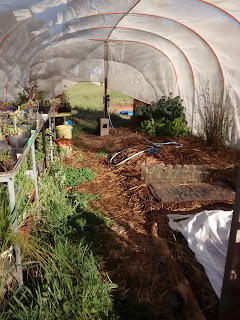 We used 20mm conduit and connectors, which seem to be holding up, despite the southerly winds giving it a little lean to the north. It took 2 separate pieces of shadecloth sewn together with fishing line to cover it. The ends are left open, although some bugs and bees get stuck on the west end, most seem to figure it out by the next morning (I think they follow the sun). A strategic hole could be made to help the critters out. 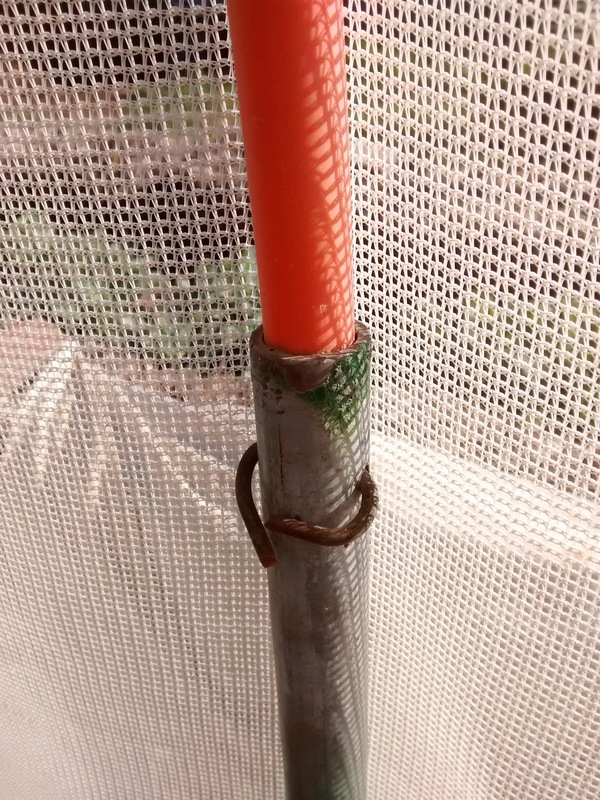 The 20mm conduit fits inside the steel bars - a hole is drilled through both and wire secures the lot. The 50% shadecloth reduces evaporation, damaging winds and hail and softens heavy rainfall. It reduces the effects of frost (although this year was harsh and a light frost made it into the shadehouse on a couple of occasions). 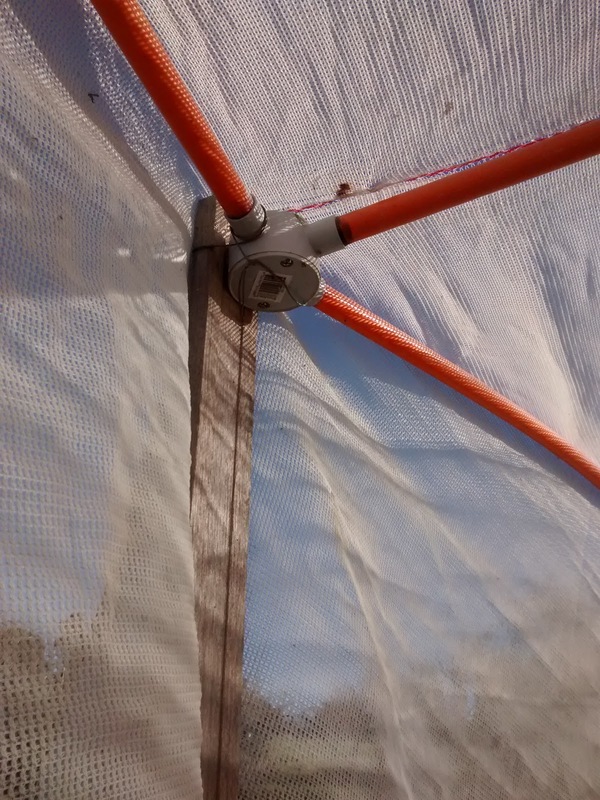 If I could change anything, I'd make circular shade domes with a sprinkler in the centre. 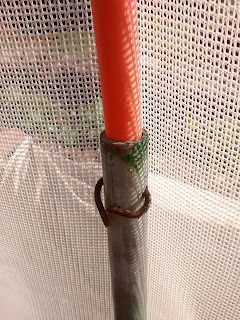 Drip lines and length-ways irrigation doesn't work well without pressure, and I find the Wobble-T to be the most effective watering system here because of that. 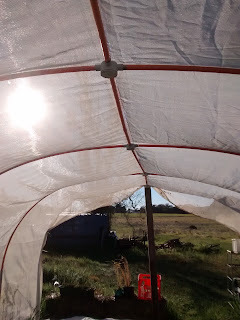 However, the Wobble-T does work fine in this style of shadehouse (and this is easier to build and cover with shadecloth than domes would be) I just need a couple more of them! Lastly, we've noticed that green leafy vegetables grown in the shadehouse are very delicious in comparison to the tougher leaves of the plants grown out in the extremes. I guess I also tend to spend more time watering (and weeding, feeding, talking to..) the plants in there, because it's a more comfortable environment for humans as well!